Ouch! 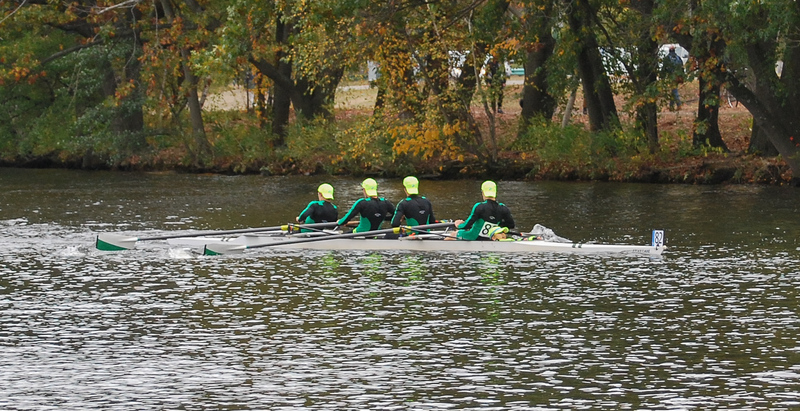 Blistered and cracked hands: the bane of all rowers. Why does this happen, what can be done to prevent it, and how can you treat what seems like an inevitable side effect of gripping an oar for so many hours each week? The skin of your hands is under constant assault from the water, sweat, pressure and friction of rowing. As a result, your body may form blisters, pockets of clear fluid (serum) that collect underneath the outer layer of damaged skin on your palms and fingers. This is your body’s attempt to cushion the skin layers underneath and prevent further injury. 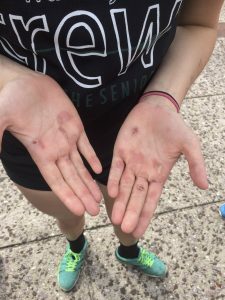 Hand care for rowers is of critical importance because: 1) blistered and cracked hands make it hurt to row, and 2) blistered and cracked hands, when not properly cared for, can progress beyond painful…they can become infected. Below is some basic guidance for rowing hand care. If you have any concerns about the condition of your hands, start by talking to your coaches before practice. 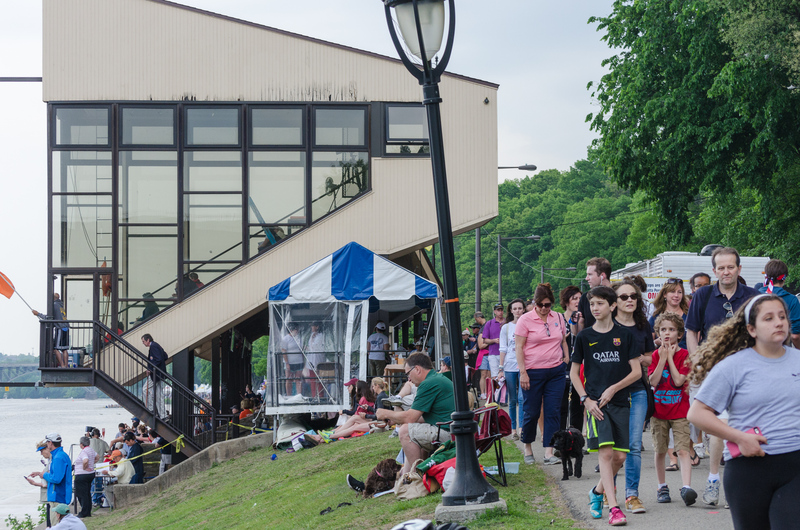 They can help you with basic blister care and have supplies for cleaning and taping your hands at the boathouse. They can also help you with grip adjustment and other ways to minimize hand damage. If you show ANY signs of infection (pus, red-streaking near the blister/wound) please seek immediate medical attention. The tips here should not take the place of in-person advice from your doctor based on your individual medical condition. If you can prevent or minimize skin damage in the first place, you are ahead of the game. Eat a healthy diet & drink plenty of water. Healthy, hydrated skin is less likely to split, and faster to heal. Some rowing websites suggest drying out and toughening skin to prevent blisters, but in truth, dry skin cracks fast and heals slow. Better to keep hands well moisturized with a rich hand-specific cream or vitamin E oil. 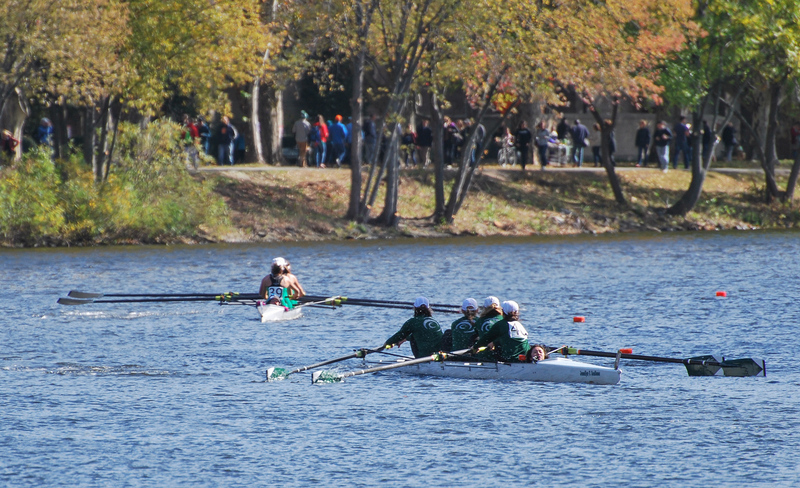 Your hands will naturally toughen over the rowing season; there is little gain and a lot of potential pain to accelerating that process with chemical drying agents. Pay attention to your grip! Focus on proper grip will help protect your hands and wrists from injury. 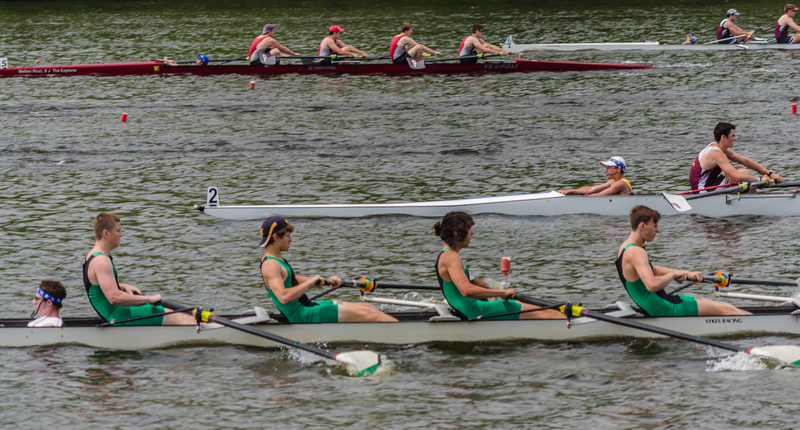 Ask your coach to review your technique and provide pointers; you can learn how to loosen that novice “death grip” without loosing control of your oar. 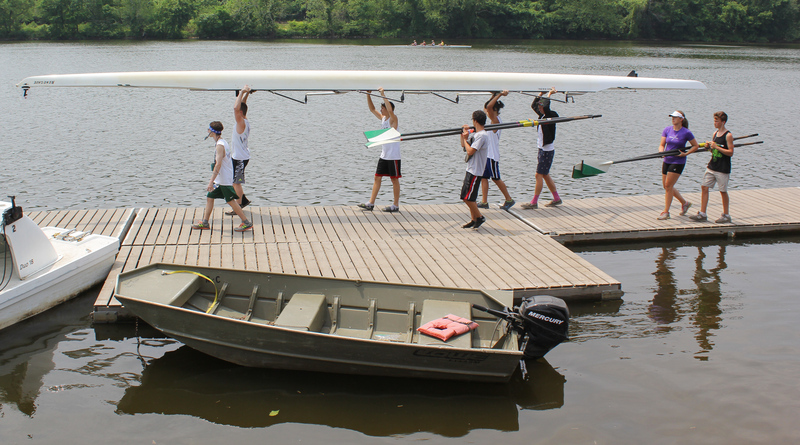 Clean your oar handles and hands thoroughly everyday to prevent spread of infection from unsanitary surfaces. If you are developing hot spots (sensitive/sore areas on your fingers and palms where you are starting to develop a blister or skin tear), have your coach help tape your hand prior to practice. To pop or not to pop a blister, that is the toughest question! Fact is, blisters often hurt…a lot. But taking a week off of training to “rest your hands” every time you get a blister isn’t very practical. While common sense tells us not to cut our skin on purpose, draining a blister, if done the right way, can often provide substantial pain relief. If possible, preserve the blister. Intact skin is the best defense. Blisters usually take a few days to a week to resolve naturally as your body reabsorbs the serum and the damaged skin sheds off. If your blister is small and/or the pain is minimal, allow your body to absorb the blister naturally, and just try taping your hands over the blisters to allow you to continue practicing. The coaches have eucalyptus tape, blister gel pads, vitamin E gel tabs, and all sorts of hand care supplies at the boathouse to do this. Remove the tape after rowing, clean your hands (and your oar! ), and if your blister has popped on its own, seek first aid from your coach after practice or your parents when you get home. Ask a coach or parent to help you with this. It is very difficult to safely treat and wrap a blister on your hand (especially those on your palms) by yourself. Tape BEFORE you row. 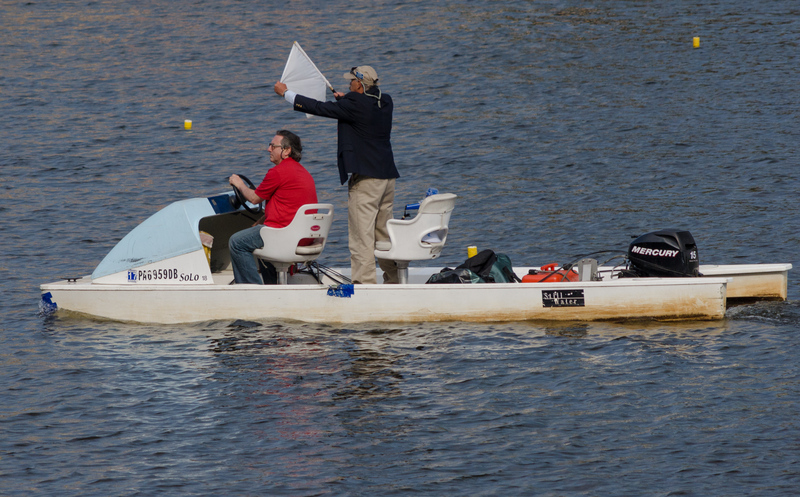 Ideally at least 20 minutes prior to rowing so that the tape has time to adhere well before getting wet and sweaty. Remove tape after rowing. You need to clean your hands, and you need to allow the skin to dry out and heal in between rowing sessions. When taping hands, always first put something over the blister (bandaid or blister gel pad) so that the tape does not stick to and rip the fragile blistered skin away when you remove it. Always cut the tape, rough tape edges from tearing tend to roll up when you row. If necessary, drain the blister. There will be times when your blister is too big or too sore when you grip your oar to row with it intact. In this case, you may prefer to carefully drain the blister. This is not something that can be done at the boathouse, so take proper steps to do it safely at home with the aid of an adult. See blister draining steps recommended by the Mayo Clinic below. NEVER rip a blister open. You will be worsening the injury and slowing your recovery. To relieve blister-related pain, drain the fluid while leaving overlying skin intact. Disinfect the blister by swabbing with rubbing alcohol or iodine. Sterilize a clean, sharp needle by wiping it with rubbing alcohol. Let the needle dry but do not blow on it (your mouth is full of germs!). Puncture the blister near the blister’s edge. You may have to do this more than once. Let the fluid drain out, but leave the overlying skin in place. Monitor for signs of infection such as pus or red streaking of the skin around the blister. Seek immediate medical attention if you suspect infection. If your hands are in particularly rough shape, you can talk to your coach about rowing in fingerless cycling gloves for a couple of practices while your skin heals. Keep any areas of broken skin very clean, and remember that river water is very dirty! Wash and apply antiseptic frequently. Do not keep damaged skin taped at times when you are not rowing. Apply vitamin E oil which will help your skin heal faster. At school and home simply cover lightly with non-stick bandages. DO NOT IGNORE AN INFECTED BLISTER! Infected blisters can lead to larger skin and even blood infections. Please see a doctor immediately if the skin around your blister is painful, hot or red-streaked, or if your blister is filled with pus. 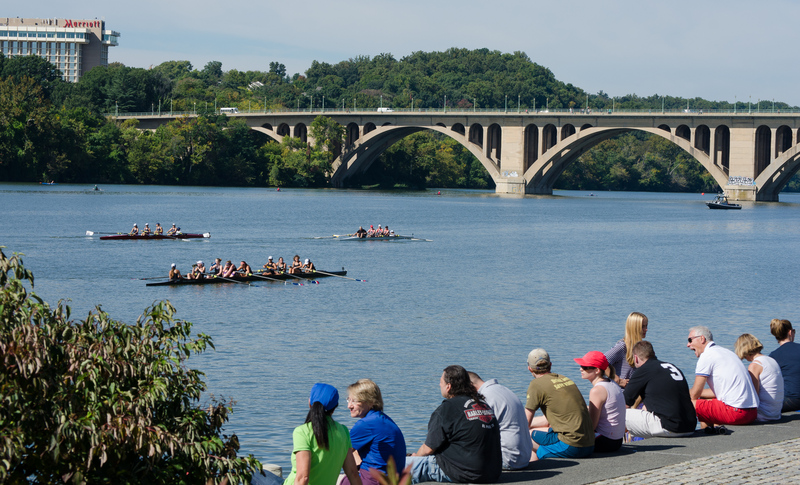 The information for rower’s health issues contained on this website is for informational purposes only. 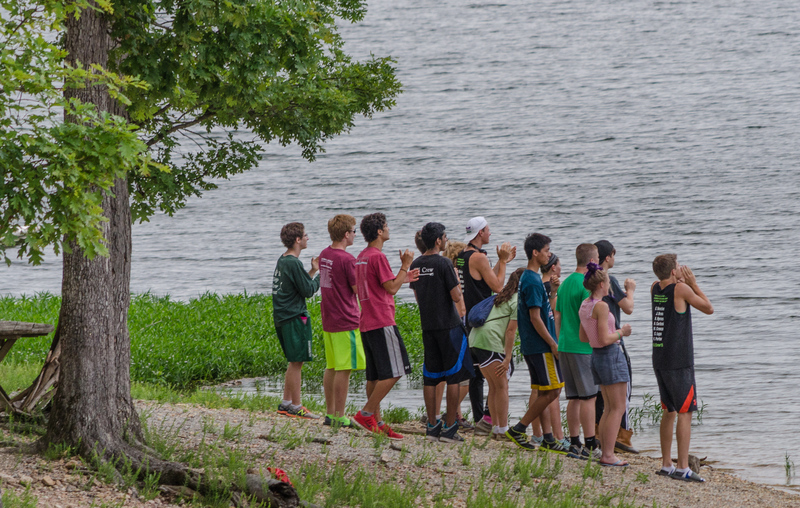 The purpose of this information is to promote understanding and knowledge of various health topics our rowers may encounter. It is not intended to be a substitute for professional medical advice, diagnosis or treatment. Always seek the advice of your physician or other qualified health care provider with any questions you may have regarding a medical condition or treatment. 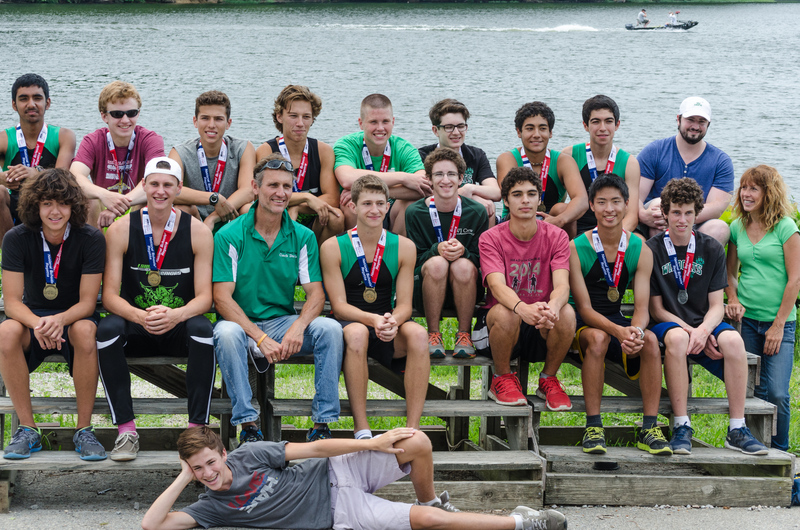 Rowers should consult with their parents before trying any of the over-the-counter medical treatments mentioned.